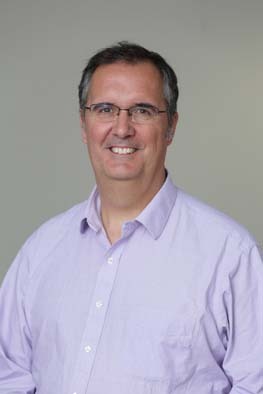 Marc Ferrer is a team leader in the NCATS Chemical Genomics Center, which was part of the National Human Genome Research Institute when Ferrer began working there in 2010. He has extensive experience in drug discovery, both in the pharmaceutical industry and academic research. Before joining NIH, he was director of assay development and screening at Merck Research Laboratories. For 10 years at Merck, Ferrer led the development of assays for high-throughput screening of small molecules and small interfering RNA (siRNA) to support programs for lead and target identification across all disease areas. At NCATS, Ferrer leads the implementation of probe development programs, discovery of drug combinations and development of innovative assay paradigms for more effective drug discovery. He advises collaborators on strategies for discovering small molecule therapeutics, including assays for screening and lead identification and optimization. Ferrer has experience implementing high-throughput screens for a broad range of disease areas with a wide array of assay technologies. He has led and managed highly productive teams by setting clear research strategies and goals and by establishing effective collaborations between scientists from diverse disciplines within industry, academia and technology providers. Ferrer has a Ph.D. in biological chemistry from the University of Minnesota, Twin Cities, and completed postdoctoral training at Harvard University’s Department of Molecular and Cellular Biology. He received a B.Sc. degree in organic chemistry from the University of Barcelona in Spain. Ferrer’s general research interests are in the integrative use of chemical and biological approaches toward the understanding of the basic molecular principles underlying multiple diseases and drug discovery. In addition to screening large diverse libraries for lead identification, Ferrer’s group is interested in screening focused libraries for drug repurposing and pharmacological mapping of diseases and target identification. He also implements large-scale pharmacological profiling of drug combinations; develops innovative informatics methods for analysis; and mines large sets of pharmacological data, as well as their integration with “omics” data sets, with the goal of better predicting drug responses in vivo. Currently, Ferrer is working to find treatments for neurological diseases, cancer, lysosomal storage disorders, pathogen infections, and many other rare and neglected diseases. He is interested in finding drugs that regulate cellular differentiation and plasticity, cellular vesicle trafficking processes, modulation of cellular stress responses, and regulation of cell death mechanisms, among others, which are processes deregulated in the diseases above. Ferrer’s team uses many technologies to quantitate the effect of drugs in cellular biological processes, including cell imaging, flow cytometry and gene expression assays. A large scale high throughput screen identifies chemical inhibitors of phosphatidylinositol 4-kinase type II alpha. Identification of Chemotype Agonists for Human Resolvin D1 Receptor DRV1 with Pro-Resolving Functions. DPTIP, a newly identified potent brain penetrant neutral sphingomyelinase 2 inhibitor, regulates astrocyte-peripheral immune communication following brain inflammation. Pharmacokinetic evaluation of the PNC disassembler metarrestin in wild-type and Pdx1-Cre;LSL-KrasG12D/+;Tp53R172H/+ (KPC) mice, a genetically engineered model of pancreatic cancer. Mutation Profiles in Glioblastoma 3D Oncospheres Modulate Drug Efficacy.